Home heating equipment should be upgraded periodically to take advantage of the latest technological developments. At Blue Ribbon, we sell and install the world's most advanced heating oil and gas heating systems. Our installers are highly trained, and they perform installations in accordance with the manufacturers' specifications so that the equipment delivers the predicted efficiency. (973) 667-7988 or contact us online. You can save as much as 30-40 percent off your monthly energy bill with the Energy Kinetics® SYSTEM 2000 - the first fully integrated heat and hot water system on the market. 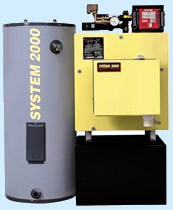 Unlike conventional boilers, SYSTEM 2000 works only when you need heat or hot water. After heat or hot water needs are satisfied, System 2000 runs an energy recovery cycle that puts nearly every ounce of heat left in the boiler to work for you. SYSTEM 2000 remains cold when no heat is needed - which saves you money! heating equipment please contact us below. Blue Ribbon Fuel installs heating equipment from some of the world's best manufacturers, including Weil-McLain. Founded in 1881, this Indiana-based company aims "to design and build the best comfort heating products on the market. To make them first. And to make them last...for decades." Weil-McLain sells a line of high-performance cast-iron oil boilers, including the Ultra, which carries an efficiency rating of 86 percent and offers an Optional Advanced Features Module. For more information about other equipment and products we offer, please call us or click here. At Blue Ribbon, we have years of experience installing gas heating systems. Our highly trained technicians are familiar with today's state-of-the-art equipment. We install your system in accordance with the manufacturers' specifications, making sure your home comfort system performs at peak efficiency. Ask us about upgrading your heating system. A new, high efficiency heating system will save you energy and money.